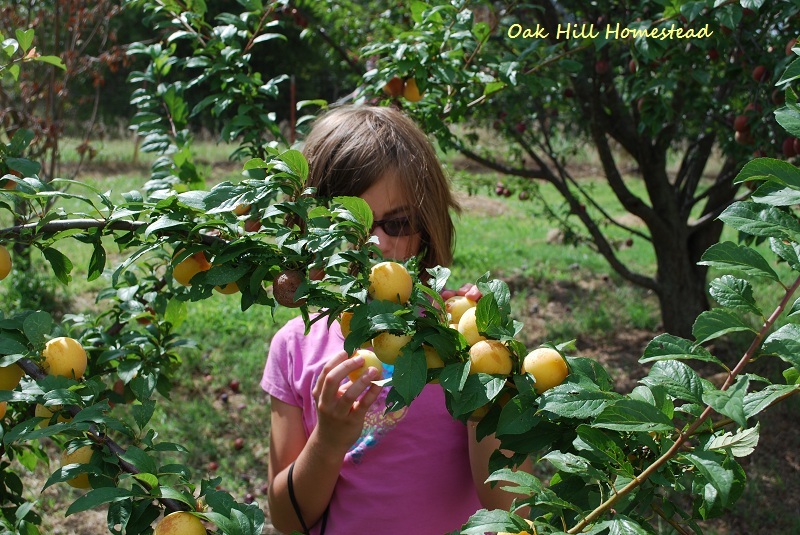 Three years ago was the first time our yellow plum tree produced fruit. 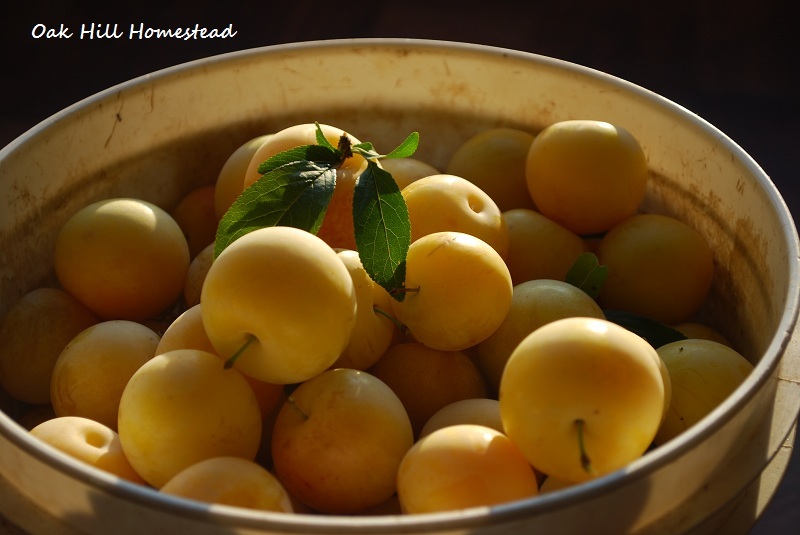 It had a bumper crop and I was thrilled to pick two 5-gallon buckets full of juicy, sweet plums the color of sunshine. The dwarf tree is about double the size it was that year, and there were so many plums this year that the branches hung to the ground. I was afraid they'd break and was thankful that they didn't. My dad used to wedge 2x4's under heavy-laden branches on his dwarf peach tree to prop them up and keep them from breaking. The problem with these yellow plums is that they ripen very quickly and spoil just as fast. We could never eat that many of them before they all went bad. I set aside the nicest, biggest ones in the refrigerator for us to eat - hubby likes them cold - and worked on preserving the rest of them. A small portion of this year's crop! 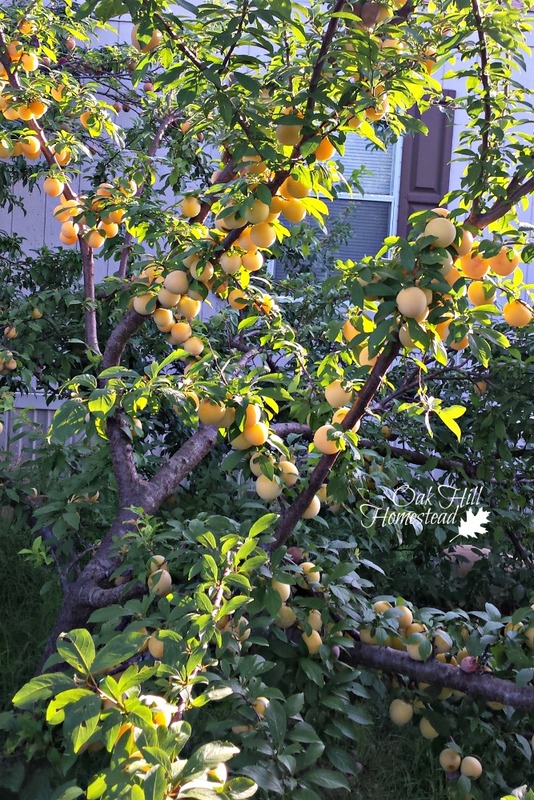 I picked a grand total of seven 5-gallon buckets of plums from this one dwarf tree. It became a race against time to get them all taken care of before it was too late. I washed them in a large bowl of cold water in the sink, then used a paring knife to cut them in half all the way to the seed inside. I twisted the two halves until the plum came apart with the seed attached to one half. The seedless half went into a bowl, and the half with the pit attached went into a large pot on the stove. Granddaughter helped me pick the plums three years ago. I froze a lot of the seedless halves by putting them on cookie sheets in the freezer, then transferring to a freezer container. I'll use these in smoothies. The rest of the seedless plum halves went in my blender. It's powerful and I didn't need to skin the halves before pureeing. I froze the puree in quart freezer bags until the rush of preserving is over and I can get them canned. It's not the ideal way - freezing and then canning - but it's better than letting them go to waste because I can't keep up. The halves with pits attached were more work. I cooked those down a bit until they were soft, and then removed the pits. Well, umm, I tried to remove them. First I tried to remove them by hand, which was horribly tedious. The seeds hang on to the pulp for dear life, even when they've been cooked. Next I tried my Victorio strainer, but the seeds are too large and clogged up the auger. My temporary solution was to put the plum halves with seeds into gallon-size freezer bags and into the freezer until I can figure out a better solution! I've ordered a food mill - it should be delivered today - and hope it will work on plum pits. Evidently plums are similar to peaches and have both "cling" and "freestone" types; if you possibly can, choose a freestone type of plum. The freezer now holds 12 quarts of plum puree as well as five gallons of plum halves that still need to be cooked and de-seeded. I also started several jars of plum vinegar. What will I do with all that puree? Sweet and sour plum sauce - we absolutely adore this stuff and use a lot of it! I'll add some of the puree to other fruits to make mixed fruit jelly. And then maybe some plum butter (like apple butter). The red plums are ripe now too, so I have plenty of work ahead of me still. I think I'm glad that there aren't as many red plums as there were yellow ones. What do you do with plums? I need more ideas! If I get enough, I can them whole in water. Very simple, easy and quick. Then we eat the plum pulp, minus the seed and drink the juice water. Very nutritious without added ingredients. I was given a few plums this year, but they had bad spots inside next to the pit so I couldn't use this technique. There weren't very many of them, so I just cut them off the pit and canned them in water. Good luck. Sometimes it's a race for time when you're blessed with such a bounty. Nothing yet, but when we get some, I'll make some plum wine with them! I love your ideas, and yeah--I get you what your are saying about getting freestone fruit. They are SO much easier to preserve! Enjoy your bounty! Visiting from The Art of Homemaking Mondays. Fern, that sounds like an excellent idea. I think I'll do that with a bucketful of the red plums (the yellow ones are already in the freezer as pulp waiting to be turned into something delicious). I like that you plan to drink the juice/water of the fruit you are canning - waste not, want not. Plum wine is a different way to use them, for sure, Kristi. Yikes that is a bunch of plums! I know it's a little overwhelming, but I have to say your plums are simply beautiful - as you said, the color of sunlight. LOL Ava. Your mother may not miss that tree but I admire the fact that she tried not to let any of the peaches go to waste. Good for her! We've always been a bit unimaginative with plums and similar fruit: the usual approach was to cut them into halves or quarters and boil them with some water and sugar until they could be poured lumpily into an ice cream container and frozen. 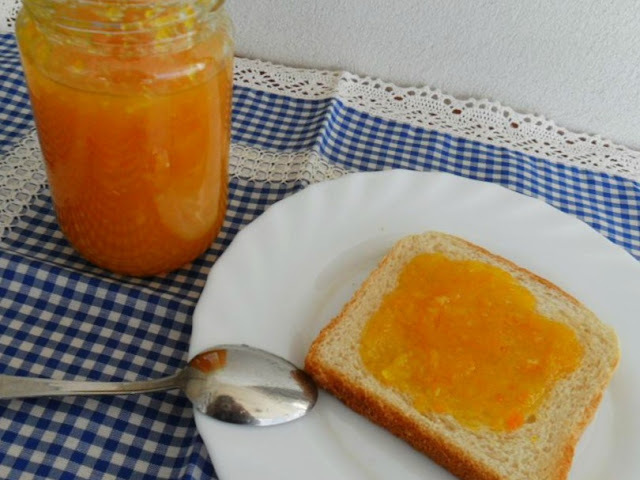 Every so often I think about preserving though: my grandmother had jars of fruit that were good for decades afterwards. That sounds like a good way to preserve them, Stephen; whatever is easy and that everyone will enjoy eating! These look wonderful, I wish I had fruit trees. What a beautiful harvest, I'm thinking jam for Christmas gift giving. My sister has those beautiful plums, too. When she gets a bumper crop, she juices them and freezes it. She uses it in with other juices or just plain. Makes a great drink! Your plums really are the colour of sunshine! I know the pits can be a real challenge to remove, that is for sure! 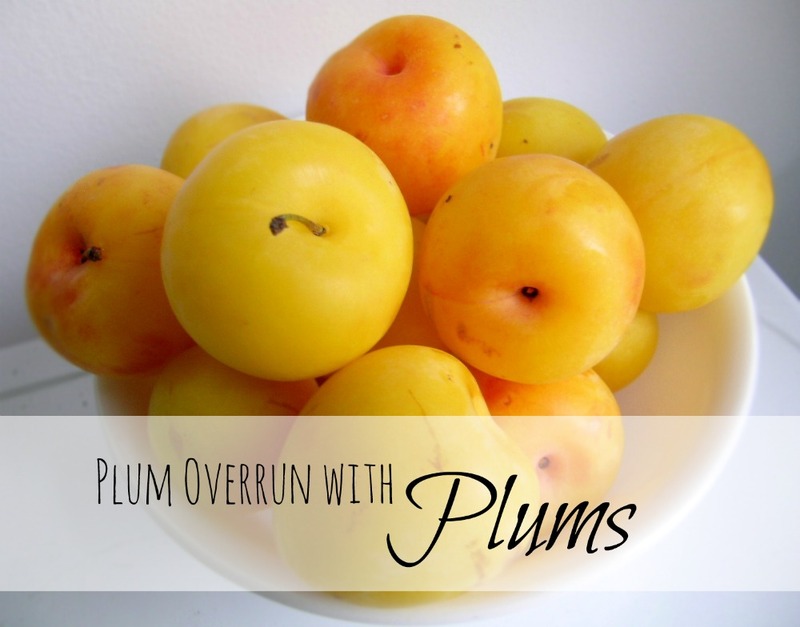 Love the recipes you linked to - and also thank you for mentioning you can freeze plum halves. I have never done that before! Pinned to my canning and preserving board on Pinterest and will share :-) Thank you for being a part of the Hearth and Soul hop, Kathi! Thank you so much for sharing, April! Wow, that's a lot of plums. You're going to busy using all of those. Thanks for linking up at the Weekend Blog Hop at My Flagstaff Home! Those plums are beautiful and the jam on the toast looks wonderful. We've had a lot of fun on picking farms this year. You're so blessed to have a homestead! Even without land you have a homestead outlook, Jen. You're doing the right thing, going to u-pick farms. Good for you! What a wonderful problem to have! LOL Thanks for sharing on the (mis)Adventures Mondays Blog Hop. I can't wait to see what you share this week! PS - This is my favorite type of plum & it must have been a plum week because I featured another blogger who posted on plums too! Thank you so much, Angelique. Yes, it is definitely plum season, and it was a good one this year. What a wonderful problem to have! Sounds like you have your work cut out for you. Enjoy! Thank you, Lisa. Yes, this problem is a blessing! I know that this is an older post but I just stumbled upon it TODAY! Thank God I did, because I've been looking for a yellow plum variety that looks like your tree. Please tell me what this gorgeous variety is! I grew up in Alabama where these plums were plentiful. Now I live in South Carolina (zone 8) and can't find any. Any ideas on where I can purchase them? Hi Leena, I hope you come back to see this, there isn't an email address asssociated with your comment so I can't write you directly. We bought our fruit trees from Stark Bros, although I'm not sure what variety the yellow plum tree is. I highly recommend this company, they guarantee their trees for one year and have excellent customer service. (I'm not affiliated with them, just a very happy customer.) Thank you for stopping by, I hope you'll come back again.